I just love this photo of Bear meeting an owl. Lots of Cardiff attractions have special toddler days on Fridays but we do not have Bear so never attend. This week his mummy was on a course so we had the chance to go somewhere. 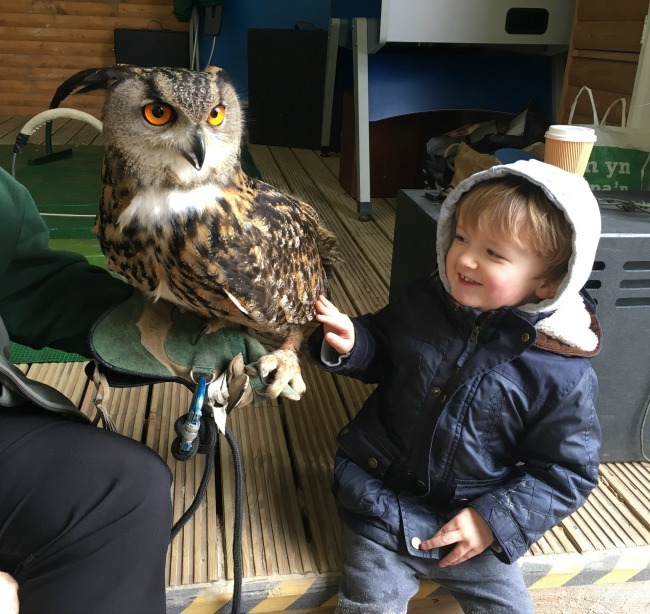 We chose Parc Play in Cardiff, an outdoor play centre, to meet some owls. We were allowed to get close and touch the owl, it was amazing. Bear wasn't at all worried and he was so gentle too. So amazing to be so close to an owl! Looking a little timid and excited in equal measure. I don't blame him. What a lovely experience. I love Owls, there is something about them. I do think they really are wise! The look on his face is adorable! Oh my goodness he looks so big. I think I'd be a bit nervous touching him. Well done bear! Hi Cardigan, what a lovely experience for Bear and what a beautiful looking owl. You'll have to see if you can sneak Bear away from his Mum on a Friday more often!